Ships in 3 business days This reflects the seller's handling time and may not include time spent in transit. If you have questions about shipping, please contact the seller using the "Ask seller a question" option above. Digital copies may not be included. Video in good used condition. Richard Dreyfuss stars as cable worker Roy Neary, who along with several other stunned bystanders experience a close encounter of the first kind - witnessing UFOs soaring across the sky. After this life-changing event, the inexplicable vision of a strange, mountain-like formation haunts him. He becomes obsessed with discovering what it represents, much to the dismay of his wife and family. Meanwhile, bizarre occurrences are happening around the world. Government agents have close encounters of the second kind - discovering physical evidence of extraterrestrial visitors in the form of a lost fighter aircraft from World War II and a stranded military ship that disappeared decades earlier only to suddenly reappear in unusual places. 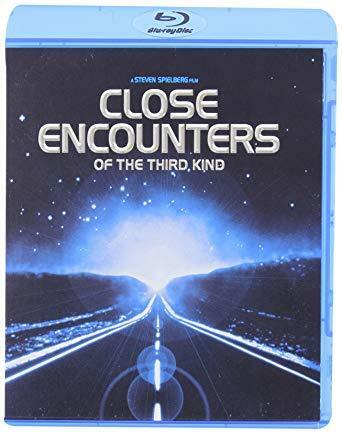 Roy continues to chase his vision to a remote area where he and the agents follow the clues that have drawn them to reach a site where they will have a close encounter of the third kind - contact.